Macht takes over as VW Group production boss on October 1. FRANKFURT (Reuters) -- Less than a year after taking over as brand chief of sports car maker Porsche AG, Michael Macht has been reassigned because he failed to fill the big shoes of predecessor Wendelin Wiedeking. Several sources at German carmakers Volkswagen and Porsche said the soft-spoken engineer was too unimaginative to improve Porsche's profile and glamour. Last summer, Macht succeeded Wiedeking, who for years was the best-paid and most successful manager in Germany. Wiedeking's star fell because he nearly bankrupted Porsche. Macht, 49, will leave Porsche to become head of production for the 10-brand VW Group, which includes Porsche, the German automakers announced Tuesday. Summing up Macht's shortcomings as a strategic thinker, a source at Porsche said he did not provide the company any clear direction, a skill that was not required of him during the decade he ran Porsche's factories. "In production, you have clearly defined, self-contained loops based on a set of parameters given to you. It is not your responsibility to make the big decisions, the political decisions," the source said. Volkswagen and Porsche declined comment. Macht effectively became one of 10 VW Group brand chiefs after Wiedeking left the company last summer after nearly ruining Porsche when he accumulated billions in debt trying to take over Volkswagen. Porsche is now set to merge next year with VW, in which it holds just over half the votes. "Macht may be an excellent production guy, but being chief of production is a relatively dry position. If you're talking about Porsche, exactly a brand like that needs nothing less than an absolute car fanatic to personify it," a VW source said. A specialist in "lean manufacturing" -- eliminating waste and slashing inventories to conserve cash -- Macht oversaw Porsche's factories and ran a captive consulting firm that implemented similar just-in-time production methods at companies such as German airline Lufthansa AG. He was considered at the time to be the best candidate to replace Wiedeking because he was a team player from Porsche's senior management who could subordinate himself within the greater hierarchy of VW Group's automotive empire. 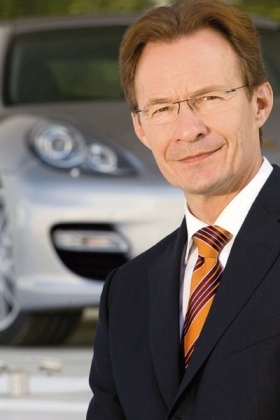 Macht will be replaced by VW Group product strategy chief Matthias Mueller. The change takes effect Oct. 1. "A year ago, it would have been a slap in the face for the entire Porsche work force had we installed an external candidate, the absolutely wrong signal, but now managers from both sides meet each other regularly and even the (Porsche) labor leader (Uwe Hueck) has seen that everything isn't as bad under VW as he always thought," one of the two VW sources said.